We've split off a full page on building a breadboard RF modulator using a free Hittite amplifier, with contributions from some people at NASA! Click here to check it out! Pulsed RF is important in radar as well as communications applications. Read this tutorial to get some basic knowledge about how pulsed signals can be obtained in the laboratory, as well as in real systems. Build the breadboard drain-pulsed amplifier described on a separate page and you will have a useful piece of test equipment for your microwave laboratory, for very little cash, you cheapskate! This page came about through some conversations with a Stanford University student who was is need of a laboratory setup for pulsed RF measurements, and has grown due to popular demand! There are two easy ways to create a pulsed signal from a CW signal. One is to use an RF switch, the other is to use a pulsed RF amplifier. In our first example we will show you how to create a pulsed signal using an RF amplifier. If this topic interests you, also see our page on oscilloscope measurements. We also have a pretty good page on microwave switches. First, here are some definitions that have to do with pulsed RF. A continuous wave signal is an RF signal that maintains full power, i.e. it is not switched off periodically. A pulsed RF signal is periodic in that is has two distinct and recurring states; the on state state provides a stable medium or high power signal, the off state has much reduced signal strength (ideally no signal is present in the off state). The video input terminal of a modulator is the signal that causes the RF waveform to switch. The word "video" here was adopted from television, where the video signal (the picture) is carried on a VHF or UHF signal. The pulse envelope is the shape of the RF pulse after it has been transformed through a detector circuit. Pulse rise time is the time needed for the pulse envelope to pass two conditions, such as 10% of final value to 90% of final value. Pulse fall time likewise is the time from 90% to 10%. The pulse repetition frequency (PRF) is the same as the repetition rate (aka rep rate) and is the frequency that the signal is turned on and off through a full cycle, measured in Hertz. It is the reciprocal of the pulse period. The pulse width is the length of time that the RF is switched on in one pulse period. The duty factor is the time that the pulse is on, divided by the period. A 100% duty factor implies that you have a continuous wave signal. Duty factor can be expressed in decibels as well as percent; a 10% duty factor is -10 dB. A square-wave pulsed RF signal is a special case in which the RF signal is on and off for the same duration of the period. A square wave has 50% duty factor. The peak power is the signal power during the pulse. The average power is equal to the peak power times the duty cycle. The on/off isolation is the ratio of the signal, usually expressed in dB. If you thought "off" meant "off" in an analog world, you were wrong! Whether you use an amplifier or a switch to modulate your signal, note that if you amplify after the pulse is created, but you may add some appreciable noise power between the pulses. Check out our page on RF switches for more general information on switches. A SPST RF switch can be placed in a signal path, and by operating the video signal at the desired rep rate. Whether your SPST switch is terminated or not is not a problem, so long as all active components in your chain are unconditionally stable. An unterminated SPDT switch presents a horrific VSWR to the RF signal in its off condition, while a terminated switch tries to provide a fifty-ohm match on or off. The rumor that FETs switch slowly is exaggerated. The speed that you can switch a semiconductor at is determined by simple RC time constants. RF switches can be designed using FETs that switch in as little as one nanosecond. In a FET switch the bias line to the gate is usually a high-value resistor to choke off the RF, sometimes as high as 10,000 ohms. Accounting for a switch-FET's gate input capacitance on the order of one pF, provides an RC time constant of 10 nanoseconds. The trick to making a one-nanosecond switch is to use a smaller resistor (250 ohms maybe), and perhaps some series inductance to choke off the RF. To drive a FET switch, we prefer to use logic from the ACT family (advanced CMOS), because these devices are relatively fast, and their outputs can pull almost from rail to rail. 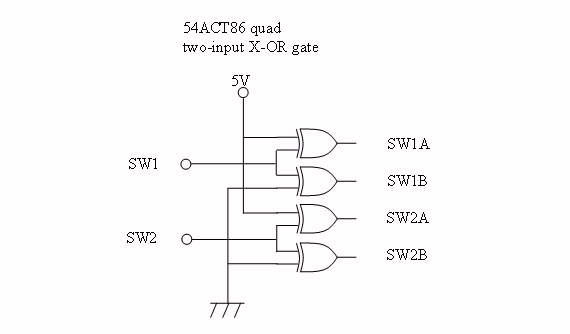 In the figure below, a single-chip quad X-OR gate is used to drive two switches (SW1 and SW2) with dual complimentary logic, which is needed for FET SPDT switches. In this case the logic voltages to the switch are 0 and +5 volts. An input-high condition at SW1 drives SW1A low and SW1B high, while an input low at SW1 drives SW1A high and SW1B low. This driver circuit should provide switching times of 10 nanoseconds or less. Check out our page on digital logic for microwave circuits! Microwave FETs require negative switching voltages, while the circuit shown above provides positive voltages... what do we do about that? There are three solutions. You can design your switch so that the FETs are "floating" at +5 volts (create an RF ground with a capacitor), or you could float the entire switch at +5 volts on your hybrid or circuit card, or you could run the 54ACT86 X-OR gate with pin 14 grounded, and pin 7 at -5 volts. Note that the last solution will required negative voltages for SW1 and SW2 commands. PIN switches can easily provide <1 nanosecond rise time if care is taken in the driver circuit implementation. But PIN diode switches are a pain to use because you have to drive them with DC current (as opposed to FETs which require only a voltage).The best driver circuits for PIN diodes are made by Whozzat. Off isolation of a FET or PIN switch depends on whose switch you are using, and over what frequency band. If you can't find a switch with great isolation, just gang two of them in series. Amplifiers can be rapidly turned on and off by changing the supply voltage and current on the output terminal (the drain, in the case of a FET). This can be effected by applying a pulsed waveform to the drain or the gate terminal of a FET-based amplifier. Pulsing an amplifier can often give you better isolation than a switch. This is because when an amplifier is turned off, it can give you beaucoups isolation. You might get greater than 50 dB difference between the on-state and the off-state S21 for an amplifier. Unfortunately, amplifier vendors are not in the habit of supplying S-parameters for their products when they are turned off, so you might have to measure this yourself! This topic is the subject of our RF pulse modulator breadboard circuit. Drain pulsing is simple in concept, you vary the drain voltage periodically between two states: zero volts, and the voltage VDS that your amplifier operates at. You need a circuit that is capable of applying drain voltage, on command from a pulse generator. We'll show you two ways to do do this, based on how much drain current you need to supply. 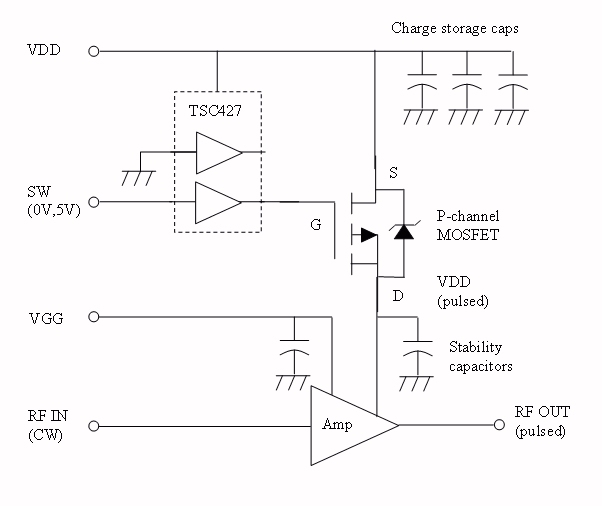 For medium power amplifiers, perhaps up to 100 mA drain current, you can use a MOSFET driver such as TSC427 to directly pulse the amplifier's drain bias (see figure below). These are commonly-available from many suppliers. MOSFET drivers are usually sold in dual-driver ICs, with a choice of inverting or non-inverting operation (TSC426 is dual inverting, TSC427 is dual non-inverting, and TSC428 provides one of of each). Be sure to terminate any unused inputs like a good digital geek. Although no one else would tell you this little secret, you can actually decrease the rise and fall time of the pulse by operating both of the dual drivers in parallel, but you will probably void the warrantee! Note1: it is good practice to place a terminating resistor at the input to the driver circuit for high speed operation. Depending on your pulse generator, 50 to 200 ohms should take care of it, but remember to analyze how much hear the termination will dissipate if the modulator is left on continuously. Note 2: we prefer the TSC427 dual non-inverting driver for this application, because once it is terminated on the input, the modulator will remain in the "off" state if the input pulse signal is lost. The data sheet for a typical MOSFET driver specifies 20 nanoseconds rise time. This is worst case, when up to a 1000 pF load is being driven (a large MOSFET has pretty high capacitance). When drain pulsing you will be driving a capacitive load if a stability capacitor is required to make your amp behave, but the amplifier also provides a low-impedance path to ground, which helps discharge the capacitance. Even with 1000 pF stability cap, on and off times will be faster than 20 nanoseconds, and you heard it here first! If it isn't, take a look at the off-chip drain bypass (stability) capacitor(s) your circuit has. If there is a 10,000 pF cap on the drain, maybe it will work OK with just a 100 pF cap. A MOSFET driver should switch in less than 5 nanoseconds under this condition. For higher-power amplifiers, you can use a P-channel MOSFET to supply several amps of pulsed current, as shown on the figure below. Here you use the MOSFET driver for what it was intended for (turning the MOSFET on and off). Depending on the size MOSFET you choose, this may slow down the circuit to 20 nanoseconds. Unknown Rectifier is a great choice for MOSFETs, they are so popular that their trademarked name of "HEXFET" is often used by engineers when they mean "MOSFET" just like "Xerox" is used by everyone to mean "copy"! Note 3: we prefer the TSC426 dual inverting driver for this application, because once it is terminated on the input, the modulator will remain in the "off" state if the input pulse signal is lost (the P-channel MOSFET acts like a second inverter stage). 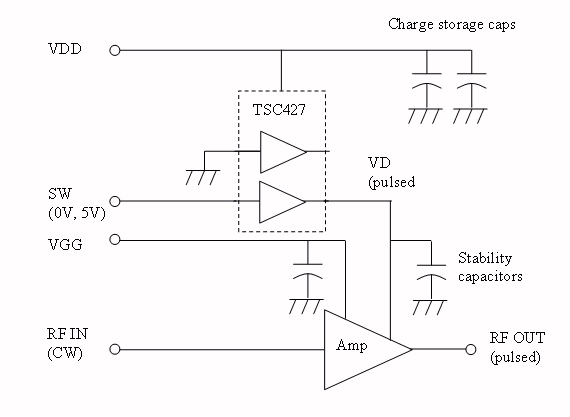 Charge storage refers to the capacitance that actually powers the amplifier when the pulse is in transition. The inductance of the power supply leads prevents the DC current from instantaneously jumping from zero to IDS. The amount of charge storage that you need can be simulated or estimated, but in practice is must be verified experimentally. You will know you have enough charge storage when your drain voltage waveform droops just a few tenths of a volt during the pulse. Start by using no less than 4.7 uF. You can use surface mount tantalum caps for charge storage, with voltage rating higher than the power supply VDD (obviously!) If your drain supply is 6 volts, use at least a 10 volt rated cap. Be sure to observe polarity. Axial lead caps could be used, but the "enemy" here is electrical lengths between everything. Don't rig the circuit up with three-foot test leads and expect it to work! Stability capacitors refer to off-chip caps that are needed to prevent low-frequency (UHF) oscillations. In the case of a pulsed circuit, you want to minimize the stability capacitor value for high switching speed. Try using 100 pF at first, and if necessary, increase it to 1000 pF. 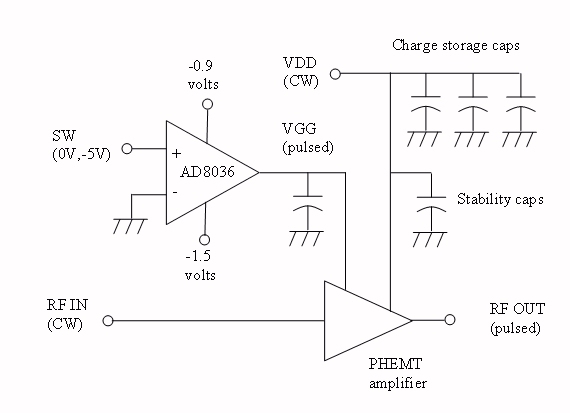 A FET or PHEMT amplifier can be shut off by pinching off the drain current. Here you need to switch the gate from its quiescent value (on state, probably about halfway to pinch-off), to the off condition (below pinch off). There is one obvious advantage that is held by gate pulsing an amplifier versus drain pulsing: you don't have to switch a ton of current, the gate terminal is practically an open circuit. At first you might think that every pulsed amplifier design would use gate pulsing. But you would be very wrong, most use drain pulsing. This is because of the two disadvantages of gate pulsing. First, many power amplifiers are operated close to their gate-drain voltage breakdown limit at the quiescent point. When you drive the gate into the pinch-off region, you are increasing the gate-drain voltage potential, and perhaps entering the breakdown region. This increased stress can present a reliability problem. The second issue is that you have to switch between two voltages that are not all that far apart, and the gate voltage during operation is far more critical to performance than the drain voltage. V1 and V2 might be -0.9 volts and -1.5 volts for a PHEMT power amp. Any noise or settling issues on V1 and your pulsed signal will suffer. For a good gate pulsing circuit, we recommend the Analog Device's AD8036 "clamping amp", shown below. It lets you set up on and off gate bias voltages independently; for example, if you are using a PHEMT power amp you can set VG(on) to -0.9 volts, and VG(off) to -1.5 volts. You still need charge storage on the drain bias lines, and stability caps on gate and drain biases, as near as possible to the amp. Like all op-amps, the AD8036 can be configured as an inverting or non-inverting amplifier. Yes, we need to add some resistive feedback to the figure!